The Rover car story really began when the Rover Cycle Company, which was founded in 1896, progressed into the manufacture of Motor Vehicles in 1904. A motor cycle had been produced a year earlier in 1903 but this was soon followed by an 8 hp single cylinder car designed by E.W. Lewis who had previously worked as senior draughtsman for Daimler. Two and four cylinder cars were to follow. One of Rovers most popular cars was an air-cooled twin cylinder model, which achieved high sales in the 1920's. In 1933 Rover underwent a change of management, and under Maurice and Spencer Wilks, new models were introduced throughout the following years. It was during this time that Rover was to gain its reputation as a manufacturer of high quality well appointed cars, a reputation that remained synonymous with the company for many decades to come. During the Second World War car production was halted, and the company were engaged in the fabrication of aeroplane parts, tank engines, and also in the development of Sir Frank Whittle's jet engine. After the war had ended, all car production was moved from Coventry to their factory in Solihull, Birmingham, where a new range of models were produced and the Land Rover was also launched. It was in 1950 that the Rover Car Company made history by building the first ever car to be powered a jet engine, and in 1956 the fibre glass bodied, four-wheel drive, gas turbine T3 was built, although of course neither car went into production. The mainstay of Rover during the 1950's and through to the early 1960's was the P4 series of cars that included the 60, 75, 80, 90 &100 saloons which were aimed firmly at what we now call the executive end of the market. 1958 saw the introduction of the large and luxurious P5 3-litre saloon, which was Rover's first unitary construction car. It was also the first of the Rovers that went on to receive the 3.5 litre Buick derived engine which is now considered one of the best V8 engines ever produced. The P5B as it is often referred to was available in saloon and coupe versions, and this car was to become a firm favourite with British Prime Ministers, including Harold Wilson, James Callaghan and Margaret Thatcher. HM the Queen was also known to drive these cars as her private transport. Rover's next new model was the sporting P6 2000 saloon. Launched in 1963 this car was technically very advanced for the day, and featured 4 wheel disc brakes, independent front & rear suspension and a newly designed over head camshaft 4 cylinder engine. During the 1960's Rover was acquired by the Leyland Group, who in 1968 merged with BMC to form British Leyland, and Rover were merged with Triumph and Jaguar. The now famous Range Rover was launched in 1970, and In 1976 Rover produced its next major success in the form of the SD1 3.5 litre saloon, which like the Rover 2000 of 1963, was also to win the title of "Car of the Year". In 1986 British Leyland was renamed the Rover Group and shortly after this the companies subsidiaries including Jaguar were sold off. Rover was to change ownership more than once again in the coming years, being owned by British Aerospace and then BMW. Today Rover is known as the MG Rover Group and is once again an independent company, and continues to manufacture MG and Rover cars at Longbridge, Birmingham. So advanced was the Rover 2000 when it was introduced in 1963 that it was to be the fist recipient of the new "Car of the Year Award" the same year. 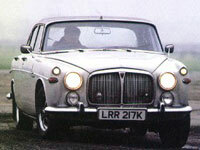 Rover introduced the V8 version of the P6 in April 1968 as the Three Thousand Five saloon, a designation it would carry until late 1970 when it became known as the 3500. Rover introduced their all new 3 litre saloon in 1958, and it was their first unitary construction car. Designed by stylist David Bache, it was a very large and distinguished looking vehicle, with a well appointed and luxurious interior.